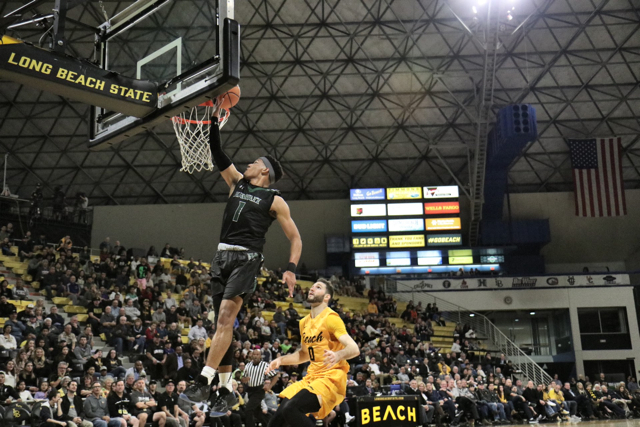 It’s been seven weeks since the University of Hawai’i basketball team dropped its Big West Conference opener at Long Beach State. The rematch couldn’t come soon enough. The Rainbow Warriors will host the 49ers in a game for positioning in the middle of the conference standings. The game is scheduled to start at 7:00 p.m. at the Stan Sheriff Center, and it will be televised in Hawai’i on Spectrum Sports. Hawai’i is 15-10 overall and in sixth place at 6-6; Long Beach is 13-15 overall and in fifth place at 7-5. The 49ers are directly in the middle of the nine-team conference, and their results indicate such. They are 6-0 against the four teams below them, and 1-5 against the four teams above them. The 49ers exposed the Warriors’ interior defense in an 89-81 victory at Long Beach, Calif., on January 4. Long Beach shot 63.3 percent from the field and out-rebounded the Warriors, 34-21, in that game. Long Beach has a candidate for Big West Player of the Year in Gabe Levin. The 6-foot-7 senior forward is averaging 18.4 points and 7.5 rebounds per game, and had a 45-point outburst in a loss to UC Davis two weeks ago. He scored 18 points in the win over Hawai’i on January 4. 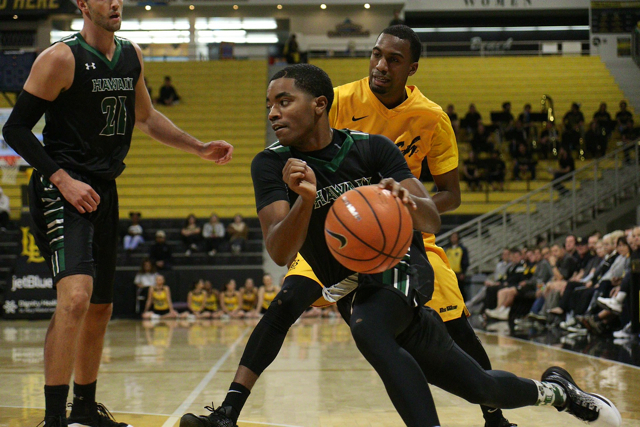 The Long Beach player who has been causing the Warriors the most problems is Temidayo Yussuf. The 6-7, 265-pound junior is averaging 16.5 points and 6.5 rebounds per game in four games against Hawai’i, dating to last season. More impressive, he has connected on 25 of 30 field goals (83.3 percent) in those four games. Those numbers are far above his normal statistics, as he is averaging 9.1 points and 5.6 rebounds per game while shooting 46.3 percent from the field so far this season. The 49ers will have a different look from seven weeks ago. Bryan Alberts, a 6-5 junior guard, missed nine games in the middle of the season – including the first Hawai’i game – due to injury, but has since returned. He is averaging 11.6 points per game and leads the team with 50 3-pointers (in only 19 games played). Alberts’ return has coincided with diminished minutes for 6-5 junior Barry Ogalue. In the first game against Hawai’i, Ogalue scored 21 points on 9-of-10 shooting. But in the 49ers’ last four games, Ogalue has played a total of just two minutes. In the loss at Long Beach, the Hawai’i guards kept the score close. The trio of Brocke Stepteau (19 points), Sheriff Drammeh (15 points) and Drew Buggs (14 points, 5 assists) combined for 48 of the team’s 81 points. Junior forward Jack Purchase started in Thomas’ spot at UC Riverside, and sophomore Zigmars Raimo received extended minutes off the bench. Purchase is averaging 7.6 points and 5.1 rebounds per game, and leads the team with 43 3-pointers. Raimo contributed six points, five rebounds and five assists in the win at Riverside. The Warriors are coming off a school-record tying 14 3-pointers in the win at UC Riverside, including 5-of-6 shooting from long-range by Drammeh. 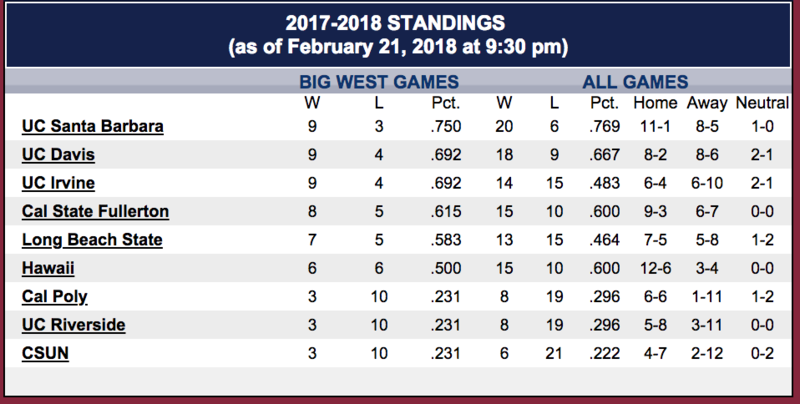 Long Beach State is the top scoring team in the Big West, averaging 78.8 points per game against conference opponents. However, the 49ers are also allowing conference opponents to score 76.1 points per game. By comparison, Hawai’i is averaging 69.7 points per game while allowing 69.2. Television: Live on Spectrum Sports – Channels 16 (SD) and 1016 (HD). Ticket Information: Ticket Information: Lower Level – $30 for all seats; Upper Level (prices vary by section) – $18 or $20 for adults, $16 or $18 for senior citizens (65-older), $5 or $7 for students (ages 4 to high school). 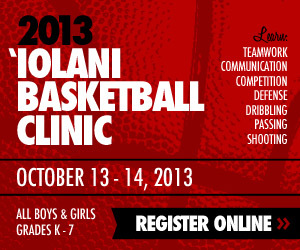 UH Manoa students free with validated ID. Parking is $6. This will be a really tough match for the Bows if Mike T doesn’t play. We need him in there and stay out of foul trouble. If Mike plays at least 30-35 minutes I like our chances. If he don’t play, it could be ugly. Definitely! If Mike is out.. it’s going to be no picnic. Gibson needs to be careful on the foul trouble. It can be done! Let’s go warriors! !